You've found the “Arkansas Barnevelder Chicken Breeders” page here at Hobby Farm Wisdom! If this is the first time you have visited our site: Welcome! Barnevelder chickens, named after the Dutch town of Barneveld, are a cross between the Dutch landrace chickens and Asian breeds imported to Europe in the 19th century. They are a medium heavy breed that is known for both its utility and show qualities. The Barnevelder is a dual-purpose chicken, laying a good amount of eggs while also producing a hearty carcass. Originally laying a dark brown egg, most Barnevelders currently produce a much lighter brown shade of egg due to breeders being more concerned with external characteristics. This has also led to decreased egg production. 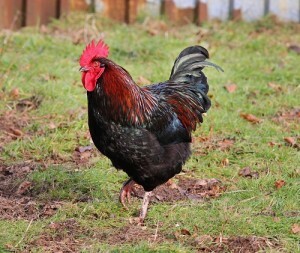 There are many varieties of Barnevelder chickens but the original and most well-known is the double laced variety with a single vertical comb and yellow legs. Other varieties include white, black, brown, partridge, blue and double laced blue. Can’t find the right Barnevelder Chicken in Arkansas? Check in: Oklahoma, Missouri, Tennessee, Mississippi, or Louisiana. Or, to see a list of ALL the Barnevelder Chicken breeders in the US: Click Here!